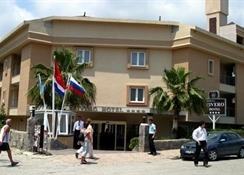 Rivero Hotel is 55 km to Antalya Airport, 45 km to the city center, 650 m to the beach and 50 m to the town center of Kemer. In Rivero you will feel so cozy and comfortable as at home. The hotel has a total of126 rooms consisting of individual air conditioning, balcony, minibar ( filled on request on an extra fee ), phone, hairdryer, and safe ( extra fee ). Rivero Hotel has prepared for its guests a variety of entertainment programs and sports events, in order to make your vacation more interesting and memorable. Some of them are internet cafe (extra fee), billiard (extra fee), hamam, sauna, fitness center, and table tennis. Sunbeds and umbrellas are free of charge. **All activities depend on weather conditions and the hotels may change programms and opening hours without any notice.